Email sterlingjamesp@gmail.com or call 706.397.8744 for us to send you examples of coverage area’s and build out expenses for LPFM stations. 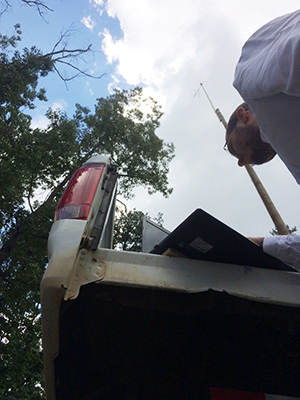 The Filing Window for New LPFM Applications has ended. Visit this page for further updates and information. LPFM Radio Stations with 250 watts! – The FCC has announced and provided rules to allow LPFM stations to operate at 250 watts. This is great news! BUT WE’LL HAVE TO WAIT UNTIL IT APPEARS, TIMELINE UNKNOWN. We Want to Apply for a LPFM Radio Station! Sterling’s Danny Langston working at a radio station tower site. GREAT! And we’re here to help you do just that. If you already understand the rules and guidelines, just skip below to the Qualifications Summary. No date has yet been set for the next LPFM application filing window. What is LPFM (Low Power FM) Radio? The FCC created two classes in January of 2000, LP10’s (1-10 watts) with a service radius of about 3.5 miles (extreme local! ), and LP100’s (up to 100 watts) with a service radius of about 8-12 miles, and they classify these stations as Class D’s. These stations have a call sign just like a traditional FM, but end in LP (such as WBFC-LP). The LP10’s have never received a specific filing window and no LP10’s exist, further as of late 2012 the Commission has decided to eliminate this class, as these are just to small (in most cases) to be viably worth the expense. LPFM licenses will be awarded for frequencies along the entire FM band (88.1 thru 107.9) with tower height up to 30 meters height above average terrain. Eligible applicants: non-commercial government, private educational, non-profit entities w/ educational purposes. 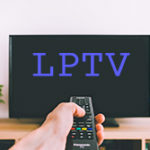 No existing broadcaster or other media entity can have any ownership interest, or programming or operating agreement with LPFM’s – except those owners that are limited to only ownership of 1 – 2 translator CP’s or licenses only. Tribal Nations may now own 2 LPFM stations. LPFM applications will be filed during a forthcoming filing window often announced 60 days in advance. Your application must be filed during that window to be eligible. An applicant must broadcast a minimum of 36 hours a week. Licensees will be limited to local entities (and board members) certifying they physically reside – within 10 miles of the city of license/transmitter site (for applicants within the top 50 markets), and within 20 miles of the city of license/transmitter site for all LPFM’s in markets 51+. 1 point for those that pledge a minimum of 12 hours daily broadcast time. 1 point pledge to air 8 hours of locally originated programming daily. 1 point for pledging to build out and maintain staff/main studio. Contact Sterling with as much information as possible. We need to know where you plan to locate your studio and the transmitter/antenna (if not at the studio location). We need to know the name of your corporation, your EIN, your board members with their positions on the board and addresses. What type of programming are you planning? Do you need us to help you understand what is necessary to meet the educational criteria? Call us and we will do a LPFM frequency search for you for free! If the LPFM frequency search results are positive, you can proceed with filing a LPFM application with the Commission. Sterling’s fee must be paid in advance of the application preparation. After reviewing the e-mailed results of our LPFM search we’ve completed for you, it is time to prepare the application. We are able to do this with client provided GPS coordinates of your transmitter site. We will file your application electronically during the FCC window filing period. This work will be guaranteed “acceptable for filing” by the FCC or your money back. This does not guarantee you will receive a Construction Permit, but it does guarantee all work will be completed accurately and filed timely. You will also receive your public file copy with instructions on the process after applications are filed. We will take care of each step of the application process so that you miss nothing. We are not a “fly-by-night” engineering company. During the previous LPFM windows many engineering companies popped up on the internet (nearly overnight) and filed many poorly prepared LPFM applications. They then disappeared and left the applicants with no or little assistance afterwards. We helped many of those applicants salvage their applications and receive a license. We will not abandon you after the application filing period. We will be available for you during the entire FCC process. With most of our clients our relationship begins with the frequency search and continues as long as our client owns the station. We will help you anytime you need as you make changes, upgrade, expand, or require general ongoing FCC assistance, from upgrade to license renewal. LPFM stations are not allowed to use directional antenna’s, omni only, except when the LP applicant is a “Public Safety” applicant, or when the applicant is filing for a 2nd adjacent, or 3rd adjacent channel when the directional justifies the request meeting spacing requirements. LPFM 2nd and 3rd adjacent, and IF waivers allow more LPFM stations under the 2012 rule changes. An allowed minor change would be a channel change to an adjacent or IF channel, and transmitter move limited to 5.6 km (3.5 miles). The 60 dbu contour of both the LPFM and translator must overlap. The translator must receive an “over the air” signal. The translator must be within 10 miles of the LP if within a top 50 market or 20 miles within a 51+ market. Digital Rebroadcasting on your translator requires matching Digital and Analog broadcast. Who is Sterling and Why Should We Hire You? Where Do We Buy Equipment and Who Will Help Us Set it Up? We do not deal in equipment – that would simply spread us to thin. We’re an engineering company, and need to keep our expertise within that realm. One of our staff, Tim Kochis does own another company that deals in exactly the equipment you need…but you don’t have to buy from him to use our services. And, you don’t have to buy from him to have him install your equipment, set up your station, and have him train you on how to operate your station. There are many, many sources of other great equipment vendors. Give us a call and we’ll recommend some reliable third parties our clients have used and been pleased with in the past. For an example of an existing, successful LPFM client station of ours, view pictures of the studio and transmitter site.